Start "Monkeying Around" with this amusing action game. Each player takes his or her turn rotating the spinner to see how many monkeys they should hang from the tree. It takes a steady hand and a cautious eye as players try not to bring down the treetop. 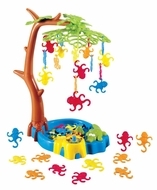 Contents: crocodile swamp base with spinner, tree trunk, magnetic treetop, 4 large monkeys in 4 different colors, 32 hanging monkeys (8 of each color), game rules.